We sincerely apologize for the neglect to the blog, while things have been fairly up-to-date on the facebook page. Future vows include more activity on this page, including updates on future events. We seek to have more than a dozen more events, leading into fall and winter. So, if there are any signs of slowing down, they are either lulls or simply behind the scenes work to prep for the next event. Please join us for one or both of our upcoming events, August 18th and 19th. 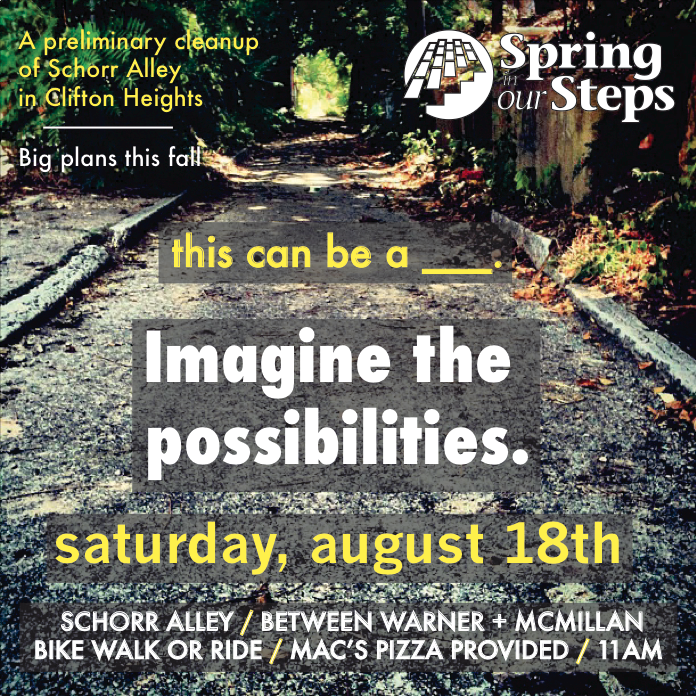 We’ve added another sight to our site inventory: Schorr Alley in Clifton Heights, a north-south corridor that bisects nearly the entirety of the neighborhood. Our work there will help support Make a Difference Day in October, which will include further maintenance of the alley and a fun community event. 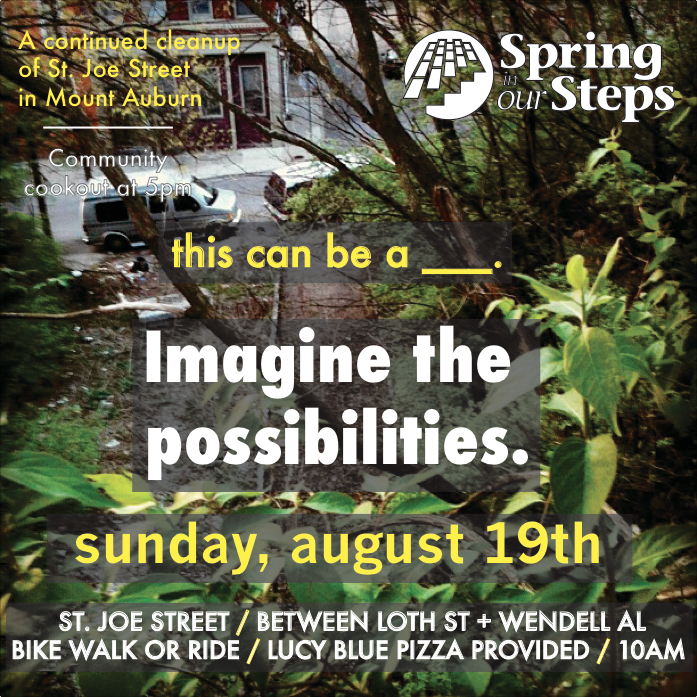 Our work at St. Joe Street will continue, as we seek to gain the support of the neighborhood to have the North Wendell Alley Steps reopened. It would be the first public stairway, closed due to community sentiment, to be reopened in Cincinnati’s history. We would like to bring the community and volunteers together by hosting a cookout at the corner of South Wendell Alley ans St. Joe Street. We are still looking for a sponsor, so that we can offer Field Roast and carnivorous options. Fortunately, we already have a grill lined up. After having a total of nine full alley cleanup events, Spring in Our Steps is extremely thrilled to host these tenth and eleventh alley workdays with other fun activities in tow! If you are interested in helping us to canvass in the neighborhood near St. Joe Street in Mt. Auburn, we would like to get the word out about our work and Sunday’s community cookout. Drop us a line, if you can join us! And, certainly, share these images at will! this is great stuff! any upcoming events coming our way? This entry was posted on August 12, 2012 by C. Huelsman in Alleys, City Steps.